If you are anything like me and you love to cook, you most probably prefer to prepare your own food rather than to order it in. However, there are nights when hunger strikes and you want to eat as soon as possible but energy is low. What to do? Do you succumb to the temptation and run to pick up the phone or do you look for quick and easy things to cook? I prefer the latter a thousand times over, choosing to cook over having someone else prepare my meal. Not only is it faster--no thirty-minute delivery deals either--but I have control over the ingredients used. I am able to decide the amount of fat needed to prepare it and most importantly, the kind of fat I want used. Mostly I have a better chance of making something that everyone will like. 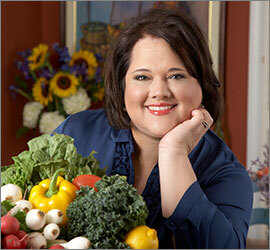 Cooking allows me to keep a stronghold over the balance of flavors that suits my family's tastebuds. At issue is the time needed to put a meal together quickly. Sometimes all I really have are a few minutes before I face mutiny in my kitchen! Ahoy, mates! Dinner in fifteen minutes or bust! I took some shaved beef that I had purchased at my local Trader Joe's and seasoned it well with sea salt, garlic powder, and freshly ground black pepper, letting it sit for a few minutes in order to allow the flavors to blend. I crumbled a large log of goat cheese into a bowl--making sure to leave some chunky pieces of cheese, so it could retain texture. 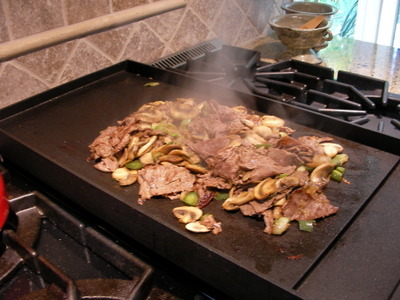 In the meantime, I sliced a couple of yellow onions, a few button mushrooms, and two large green bell peppers and sauteed them on my griddle which I drizzled with just a little olive oil. I added the shaved beef and cooked everything quickly over medium-high heat, until it was perfect--the vegetables sill retained some crunch and the beef was juicy but not rare. Since I had a couple of gorgeous Ciabatta loaves, I sliced those thickly and toasted them lightly. Then, I assembled the sandwiches. The result was a delicious melange of textures, temperatures and flavors. I had the crusty bread and the hot filling perfectly juxtaposed with the creamy cheese. Mellow mushrooms were the perfect foil for the tanginess of the goat cheese. 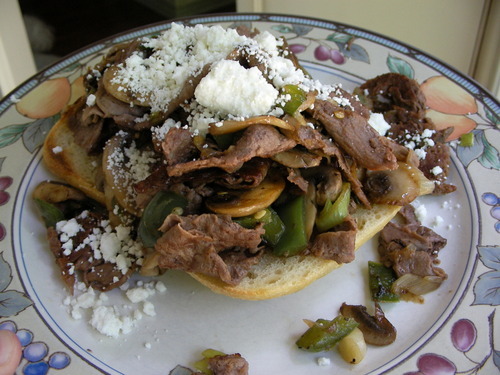 We happen to be purists when it comes to steak sandwiches, therefore we make sure nothing comes between our bread and our beef--no ketchup, no mayo, no condiments. Having said this, some of us (I won't name names) did opt for a spicy addition in the shape of home-made pickled jalapeno peppers. Oh well...if you can stand the heat, go for it! I tossed a quick salad made with romaine lettuce, sliced radishes, grape tomatoes, and chopped olives with an easy vinaigrette made with 3 parts olive oil to 1 part of sherry wine vinegar, which I seasoned to taste with salt and pepper. Dinner was ready in 15 minutes and everyone was happy! There were no cardboard boxes to deal with, and clean-up was a cinch. The next time you're in a hurry to put a meal on your table, create your own rendition of a gourmet sandwich. Quick and easy, this was the perfect no-fuss, no-muss meal. Try it! Copyrights Sandra Gutierrez, 2008. All Rights Reserved.